Money flow in technical analysis is typical price multiplied by volume, a kind of approximation to the dollar value of a day's trading. 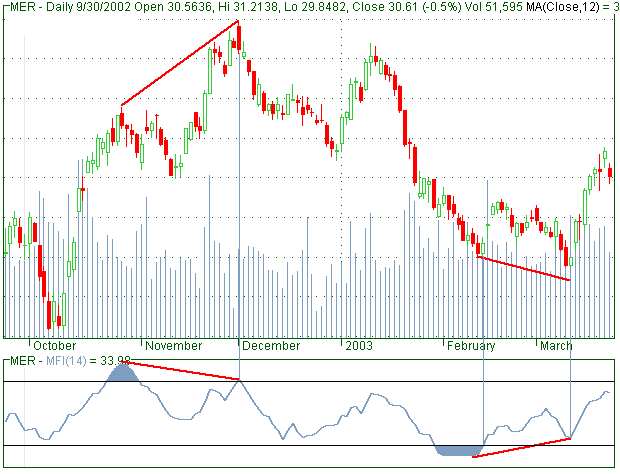 It will be noted the MFI is constructed in a similar fashion to the relative strength index. Both look at up days against total up plus down days, but the scale, ie. what is accumulated on those days, is volume (or dollar volume approximation rather) for the MFI, as opposed to price change amounts for the RSI. It's important to be clear about what "money flow" means. It refers to dollar volume, ie. the total value of shares traded. Sometimes finance commentators speak of money "flowing into" a stock, but that expression only refers to the enthusiasm of buyers (obviously there's never any net money in or out, because for every buyer there's a seller of the same amount). For the purposes of the MFI, "money flow", ie. dollar volume, on an up day is taken to represent the enthusiastism of buyers, and on a down day to represent the enthusiasm of sellers. An excessive proportion in one direction or the other is interpreted as an extreme, likely to result in a price reversal.